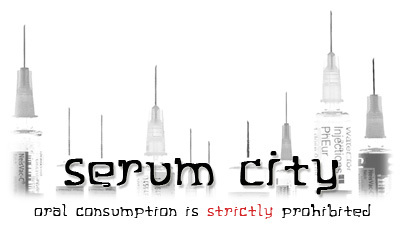 Check out http://serumcity.atspace.com/ for the synopsis and production stills. A 'blast from the not-so-distant past'. 'Serum City' is my graduation short film, produced back in 2006, on which I served as the DP and editor. This is probably THE definitive inspiration for me to go into editing. Back in 2006, I had worked out my class schedule such that I didn't have to take any modules in my last semester, so that I could concentrate on my short film. And concentrate I did! I turned up at the editing suite almost every day, tweaking with the edit and... tweaking with the edit more. Sometimes with the director and our faculty supervisor; but usually working alone. So not too long after a grueling week-long shoot as DP [my legs were on fire from standing and climbing every single day - thank goodness my director is a qualified massage therapist! ], I started logging and capturing my rushes... then, edited to script... and soon, we hit an 'existential crisis'. The film wasn't working if we were to cut to script. This was... probably in February, when we had to deliver by mid-March. This led to a complete overhaul of the film structure - scenes were juggled around quite radically, shots were dropped, re-shoots were done [thankfully, nothing too drastic]. As much as it drove me nuts to have to do a COMPLETE re-cut, I distinctively remember being positively reinvigorated, when previously, I was getting quite ho-hum about the film/editing it. So yeah, that was intense but loads of fun. There was a lot of to-and-fro with the director, so that was a very good process. Of course, having ~5 other groups of people going crazy in the same edit suite [FCP FTW!] got 'interesting' nearer the deadline, haha. I'm glad I chose to stick with FCP, even though the school had 4 Avid Adrenalines available as well. I enjoyed the ease of use [fire up mac; connect to SAN Network; launch FCP; edit... toggle over to Firefox when bored/rendering/needing help] and being able to work directly with Adobe Photoshop and AfterEffects files from the same machine and network. After that, it was easy to author a simple customized DVD in DVD Studio Pro, or export to various .Mov files.